Yes, it’s officially Autumn. Finally, I can turn on my oven for supper without the risk of overheating the entire house and melting into a puddle. Hooray, now I can make roast chicken again … which is, you know, nearly my favourite meal of all time. Everyone has different reasons for why they’re not cooking as often as they want to. For example, if you’re coming home at 6 pm it’s hard to start cooking dinner right then and there, especially if you have no plan. Sure, you could start cooking at 6 pm and eat by 7:30 pm, but it’s a bit trickier if you have children who need to eat earlier. Sometimes we can’t put dinner on the table because we haven’t done the grocery shopping. Sometimes we can’t put dinner on the table because we’re doing too many other things. Like committing ourselves to too much else. Lack of groceries in the house. And finally, it’s easier to order to take-out, or to the grocery for pre-package food. The pre-packaged food from the grocery store tastes pretty good, but you don’t always know what’s in it. And it’s about 2-3 times more expensive than it would take to make the same thing at home. I think it’s interesting that the food that they sell at the front of the grocery store in those packages – like the single serving lasagne, or the fish and rice – it isn’t very exotic. It’s like home cooking for people who don’t want to cook at home. Is a weekly meal plan the answer? Yes, I think so. You’ll save money. You’ll think less. You’ll shop less. You’ll eat better. I’ve broken down meal planning into 8 steps… in the beginning that will seem like a lot steps, but in the end it takes 25-30 minutes ONCE A WEEK, and then you’ve got all of your meals planned for the week, and you don’t think about “what’s for supper” again. Start by picking your favourites. 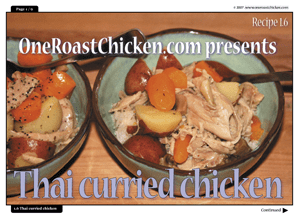 The roast chicken recipe that takes absolutely no effort, and an hour later it’s done and then you’ve got leftovers for sandwiches or soup or Thai curried chicken. 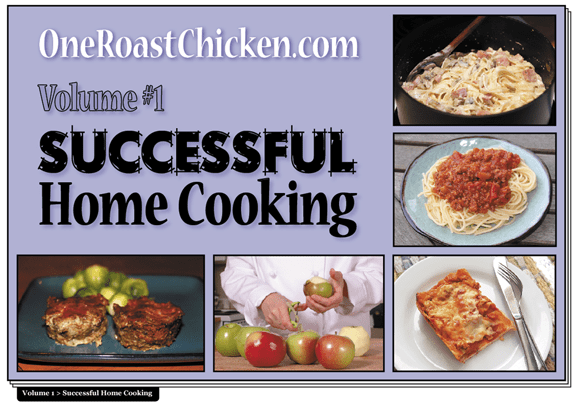 This week’s cooking letter has been adapted from “Eight easy steps to plan your week so you can eat at home, save money, be healthy, and impress yourself!” This 16-page Special Report #1 > Motivation and Meal Planning is available by PDF download now. As always, I’d love to hear your feedback. Just hit reply to this email and drop me a line 🙂 You can always reach me at shelley@oneroastchicken.com. 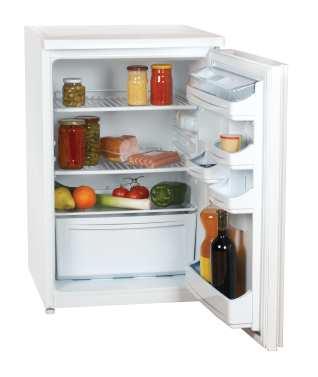 Do you have ‘mystery meat’ in your freezer? I feel like Autumn is the beginning of a new year, even more so than January. It’s the ‘back to school’ phenomenon … new pencils, new clothes, new backpack. Everything is shiny and brimming with possibility. Don’t know where to start? Have a look at what’s in your house. If you don’t want to throw out food, you can always give it to the homeless shelter in your town. I did this recently – I’m afraid to tell you – I got married last year and we had a reception here at the house where we had cake and champagne. I made three chocolate cakes, and only half of one cake was eaten. I cut the leftovers in half and froze them, and thought “someday we’ll eat them.” And six months later they were still in my freezer, kind of depressing … so I took them down to the women’s shelter with cans of frosting, and they were super thrilled to see me. It was going to be the treat for bingo in the afternoon. While you’re looking through your house for food you know you’re not going to eat, at the same time you can make an inventory of what you DO have that could be turned into a meal. 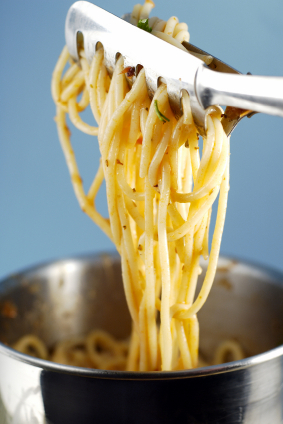 For example, if you have pork tenderloin in the freezer, we could put that on a short list of “let’s find a way to use it up this week.” If you’ve got some pasta, for example a box of spaghetti, we’ll find a meal for that. Start with what you already have in the house so that you’re not buying every ingredients for all of your planned meals. Sometimes I’ve got a box of lasagne noodles that’s been there for 2 weeks, or 3 weeks, or 4 weeks. And I’ll open up the cupboard and think “those noodles, better find a way to get rid of those noodles.” Or it could be a single can of coconut milk, and that reminds me of the Thai curried chicken recipe that I like to make, so that’s what I’m going to make this week because it uses up an ingredient that I already have. Check your pantry, and your deep freezer. If you have a half-pound of ground beef, or a pound, or a piece of pork tenderloin or a chicken breast – let’s find a meal to use that up. I’m sure there are lots of people who have deep freezes full of mystery meat! 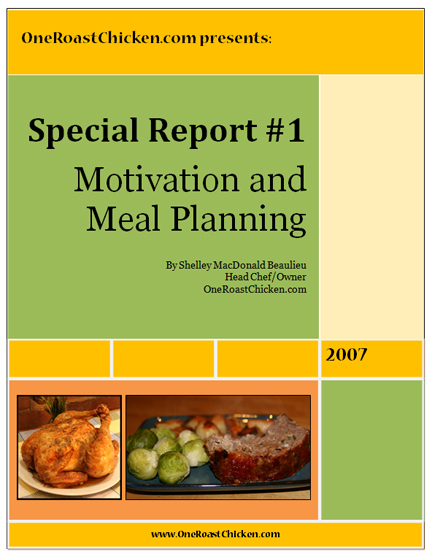 This week’s cooking letter has been extracted from Step #3 in the “Eight easy steps to plan your week so you can eat at home, save money, be healthy, and impress yourself!” This 17-page Special Report #1 > Motivation and Meal Planning is available by PDF download now. Yes, it’s finished, yeah hooray. The collection of recipes that I’ve been working on for you, for over 6 months, was completed Friday June 8th. And everyone who pre-ordered a copy has already received their volume of “Successful Home Cooking.” Have you received yours? I thought it was only going to be 95 pages, but it kept growing and growing –– there was so much great stuff to include — that the document grew, and grew to 122 pages long! Thank you so much for sending me the pdf version of your book. Was I ever pleased when I came across your site two weeks ago. I immediately signed up for your newsletter and what excellent candor! It is so wonderful to have an email from a real person in my inbox every week. I agree with you about your last email. I have been pulling my hair out in the kitchen because once I had settled on a free recipe [out of thousands] from the internet, it almost always turned out badly. All I want are some down-to-earth recipes from somebody who has tried them and say they work. Yours is the first cookbook I have ever bought — mine have all been passed down — and I don’t find my current recipes very practical because they are for six to eight [my Grandmother had a big family] and I am only cooking for three. I am the kind of person that usually cooks meals that include all the food groups already [fajitas, stir-fries etc.] because I am panic-stricken about side-dishes. I will panic no more, however, because you have saved me the grief and simply told me what to include as a compliment to the meat dishes. 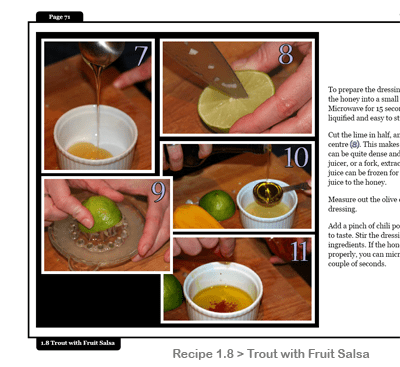 The book is comprehensive, the recipes interesting, mouth watering, the ingredients are available. To boot, you have included a price list of each recipe. You have taken all the major kitchen concerns into consideration, yet kept it simple without making me feel stupid. What this cookbook is, really, is a cooking class with enough good solid recipes for me to keep busy for some time. The kitchen is no longer a place to fear, but a place to rejoice. I am all praise, Shelley — my only complaint is not finding you earlier! It’s Spring where I live, and Spring is the perfect time to break out of our regular food routines. Away with the heavy table cloths, the dark napkins, the dimmer switch in the dining room. Now is the time for long evenings, picnics, lighter meals, and candles outside. In fact, eating outside is one of the things I love most about this time of year. Breakfast: Starting as soon as humanly possible (and this year that was at the beginning of May), I start eating breakfast on my apartment balcony every day it’s even remotely possible. My favourite breakfast is toast with butter and a layer of smoky cheese (Applewood cheddar if I can find it), topped with one lightly egg fried in a non-stick pan. And a side of green veggie (beans or spinach or bok choy). And decaf coffee. I set myself up on the wooden patio table, with a place mat, napkin, and a magazine. I sit, facing east, reading Food Illustrated or Cook’s Country until it gets too warm and I have to go inside and get to work. If you don’t have a balcony, maybe you have a porch (veranda? ), the front steps to your apartment, or a nearby park bench. I find that eating breakfast outside is a quiet, peaceful way to begin your day. Lunch: If you work in an office, you can take your packed lunch away from your desk and head to the nearest playground. Your tuna sandwich and pickles taste magical when eaten outdoors. Use any excuse to escape your florescent environment. If you work right downtown, you might have to hunt for a restaurant with a patio where you can order a cup of coffee and eat your homemade lunch. Some places are more friendly about you bringing in ‘outside’ food than others… search a bit until you find someplace near you. 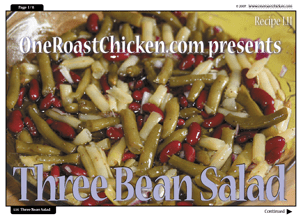 Dinner: Plan a picnic supper, leftover Roast Chicken with Rosemary and Three Bean Salad go well together. Cold roast chicken is divine, and goes well with the vinegary bean salad. Add extra chick peas (garbanzo beans) to the salad for extra protein. Take a blanket, a good book, and settle yourself near the best view – whatever kind of view you can find: beach, mountains, prairie, duck pond. And since it’s nearly a scientific fact that food tastes better outside, now is the time to find the door ‘out’ of your usual routine. This afternoon I proposed to André that we could make margaritas in glass jars with lids, pack a picnic, and head off the park for supper. Then I thought I’d sweeten the deal by saying we could take the new laptop computer, pop in a DVD, and watch a movie outside under the stars with our mason jar drinks. He looked at me like I had a watermelon where my head should be. OK, maybe we’ll leave the movie at home. Welcome this week to all of our new subscribers. And, of course, welcome to those of you who’ve been here awhile … come on, everybody wave ‘hi’ to Lida in Sweden, Khadija in Mauritius, and Eva in Kenya 🙂 I’m glad you’re all here. 1. When I’m making Chicken Tandoori which calls for 1.5 teaspoons of lemon juice, I take my lemon, remove the zest with a microplaner or box grater, and then wrap the zest in plastic and stick it in the freezer. This comes in handy for Apple Pie for One, which calls for just a bit of lemon zest. OK, so then I cut the lemon in half, and juice both halves, and this produces about 1/4 cup of lemon juice. 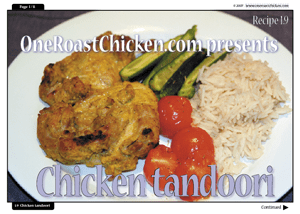 I use what I need for Chicken Tandoori, then I put the rest in a small jar in the freezer. I save tiny jars for lemon juice, like the kind that capers come in. 2. I make a Roast Chicken dinner about every two weeks or so. In my house, a small chicken makes enough for the two of us for dinner (we eat the white meat), and then when the chicken has cooled off, I remove the leftover chicken and freeze it in a plastic container. Now I’m fully equipped for my favourite Friday night one-bowl dinner (Thai Curried Chicken). I just pull out the frozen chicken and add it to the pot of bubbling coconut milk and vegetables while the meat is still frozen. 3. I buy lean ground beef from the grocery store in a jumbo family pack, and then I freeze it in half-pound packages. When I want to make hamburgers, I pull out one half-pound package and a couple of sausages and I’m ready to cook. If we’re feeling more like Meatloaf with Spicy Ketchup, then I defrost three half-pound packages. 4. I make chicken broth from the leftover bones every time I roast a chicken. And once the broth is made, I freeze it in one-cup jars that might otherwise be used for jam, or I reuse pickle jars (or others) which hold about 4 cups. We go through a lot of chicken broth on a weekly basis so it’s definitely cheaper and easier to have homemade on hand. I use chicken broth instead of water to cook rice. 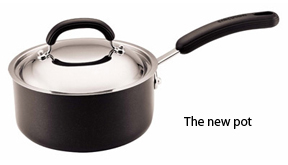 I use it to make Instant Beef Soup (which uses a combination of beef and chicken broths to get the best flavour). And my favourite Thai Curried Chicken recipe needs 1/3 cup of broth in the sauce, and then more broth to cook the rice. 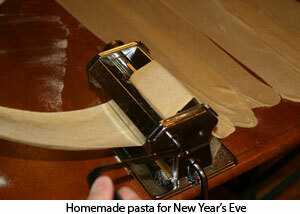 On New Year’s Eve, I thought I’d try out the new pasta machine I got for Christmas. The first batch of dough I made turned into a giant thick glue in the food processor and nearly burned out the motor in the machine. André washed it all out, dried and wiped, and I started again with a different recipe. On Valentine’s Day, also this year, A. worked all day and then went to school in the evening until 9 pm. 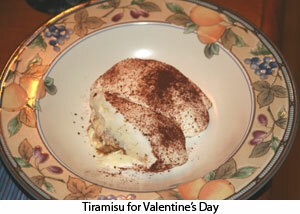 The tiramisu that I slaved over turned out great, but the shrimp stirfry I tried to prepare for Valentine’s Day dinner was completely inedible. The shrimp were old and frozen and smelly, although the fish boutique had definitely charged me otherwise. Dumped into the garbage. Do you have a kitchen disaster story? Just post a comment or drop me a line 🙂 I might use your story in an upcoming cooking letter. Got pictures? Send those, too. Everyone has a great cooking disaster story. And they happen from time to time. Double a cookie recipe but forget to double the sugar. Results are inedible and end up in the garbage. I used to be really sad when this happened. Think of the waste, the cost, why am I such an idiot? I remember once when I was about 20 years old, and not a very experienced cook, I attempted to make a pork stew using my aunt’s recipe. The whole thing was a giant disaster — pork too tough to eat (she must have used pork tenderloin, where I had picked something tough and cheap). I remember shedding tears as I threw the entire meal in the trash. Waste. Cost. Idiot. Since then, I’ve discovered a few secrets to successful cooking. 1. 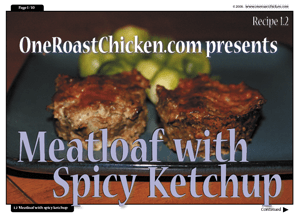 A great recipe with step-by-step instructions. Don’t you love recipes that help you succeed? How about recipes that let you follow along with pictures so you can see if you’re in the right place, getting the right results. Recipe 1.5 > Dutch Apple Pie is a perfect example. 2. 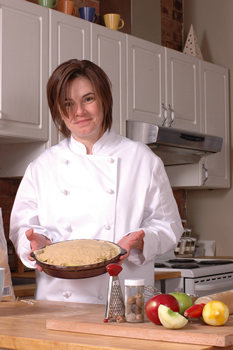 A real person who can explain the tricks to making the recipe successfully. This could be your mom or your neighbour. Or it can be me! Send me an email, I’d be happy to answer your questions. 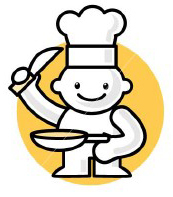 I believe that every recipe has a “recipe gremlin” — a little trick that if you don’t know about, the recipe won’t turn out as well as it could. And most people don’t tell you about the recipe gremlins… They say peel and core the apples, but do they remind you check the insides of each apple section for that plastic-like piece of apple core that you DO NOT want to find in your pie? 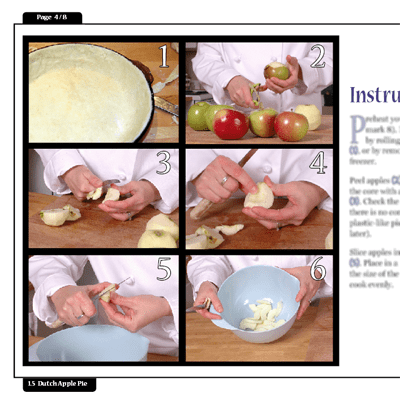 (In the photos above for Recipe 1.5 > Dutch Apple Pie, this recipe gremlin is explained in step #4). 3. A great cheering section who’ll support your attempts, and who’ll eat your recipes, no matter what! This can be your husband, wife, grandkids – anyone who’ll say “that’s great” even when it isn’t. And when you burn the potatoes he’ll say “I like them that way” when probably he doesn’t. And while I still sometimes have kitchen disasters, I’m more matter-of-fact about it now. If you cook often enough, sometimes it’s not going to work out as planned. I try to have a sense of humour about it. My cheering section says “ce n’est pas grave” (literally: it’s not grave, but really what he’s saying is “it doesn’t matter.”) And finally, I’m starting to believe him. Do you have a kitchen disaster story? Just post a comment. Got pictures? Send those, too.